When Gore Verbinski’s Pirates of the Caribbean: The Curse of the Black Pearl exploded like a stray cannonball onto the scene in 2003 it felt like a blast of fresh air. Irreverent, smart and thrilling, and fronted by an instantly iconic Johnny Depp as the mincing, deceptively imbalanced Captain Jack Sparrow, it was one of the best summer blockbusters of the decade and quickly amassed a legion of fans. Unfortunately, the series' creators seemed perplexed by the sly swashbuckling appeal of the film, and produced two gargantuan-sized sequels of varying quality which stretched the property's thin mythology to the breaking point and left many feeling a tad seasick. By the end of 2007’s frustrating At World’s End, it was clear that the franchise needed to scale back and return to its fast, loose and fun roots. Now, after four years of lying dormant and under the directorial command of Rob Marshall of Chicago and Nine fame, Pirates of the Caribbean has sailed back into theatres with On Stranger Tides. 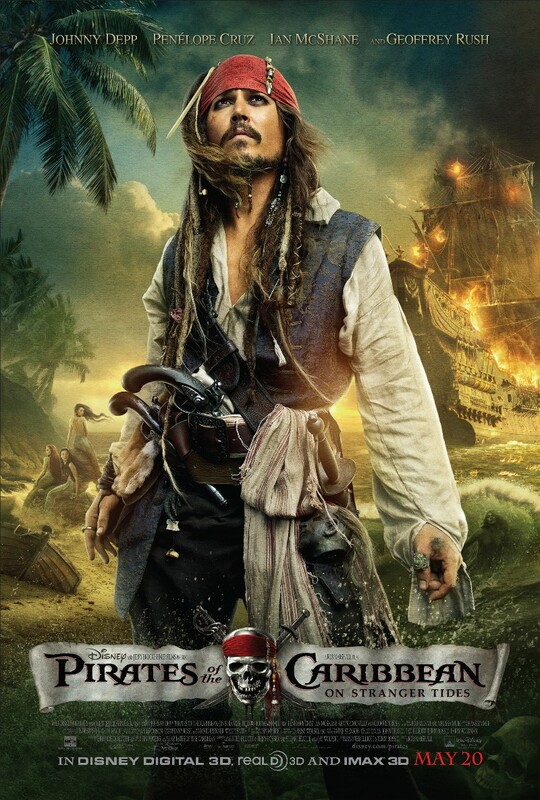 Written by returning scribes Ted Elliott and Terry Rossio, this latest chapter excises the majority of the characters from the previous films – save Captain Jack (Depp), his right hand man Gibbs (Kevin McNally) and newly peg-legged frienemy Barbossa (Geoffrey Rush) – and is pitched solely as a stand-alone adventure, involving the quest for the legendary Fountain of Youth. Alas, though, even free of the excess baggage, this new film feels soggier than the last episode; a largely joyless and plodding excursion that wears out its welcome after about an hour. 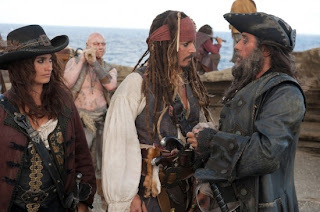 It starts out innocently enough, with Captain Jack being forcefully recruited by King George (Richard Griffiths – battling tirelessly to out-camp Depp) and newly respectable privateer Barbossa to beat the Spanish to the elusive eternal life-spring. Following a nifty carriage chase escape – which includes a 10 second Dame Judi Dench cameo (Kids love a good Dench cameo!) – Jack is reunited with former flame Angelica (Penelope Cruz), a fiesty she-pirate who has been - inexplicably - posing as the foppish captain to assemble a crew for her own quest. Turns out, Angelica is the daughter of the notorious Blackbeard (Ian McShane), who is hoping the Fountain will rewrite a prophecy regarding his own death. As Blackbeard’s formidable ship Queen Anne’s Revenge hits the high seas, racing against the Spanish and Barbossa, the complications begin to accumulate, and the movie’s momentum begins to flag. According to pirate lore, one can’t just drink from the Fountain. No, they must also bring with them mermaid tears and a pair of magical chalices. How this combination came to be is left purposely vague. Apparently the Fountain’s creator or creators wanted to make it very difficult to use, which is fine, but why then assemble it at all? Weird sense of humour? I know, I know, magic and logic rarely go hand-in-hand. Anyhow, the mermaid tears prove particularly difficult as, in the Pirates-verse, mermaids are flesh-eating vampires who can tear down a ship with their bare, uh, hands. However, Blackbeard’s crew luck upon the wounded mermaid Syrena (Astrid Berges-Frisbey), who quickly – emphasis on the word “quickly” - draws the romantic interest of an idealistic missionary named Philip (Sam Claflin – bland as bland can be). As the two star-crossed lovers from vastly different worlds exchange yearning glances, Jack, Blackbeard, Barbossa et al. battle for possession of the chalices and trek through the jungle in search of the ultimate prize: immortality. Despite an obvious attempt to distance itself from the bewilderingly labyrinthine At World’s End, On Stranger Tides still feels directionless and messy. The film doesn’t really tell a story, so much as string together a series of loosely related plot points and action beats. There’s nothing wrong with coasting on style and attitude – lord knows, James Bond’s been doin' just ducky for almost 50 years – but when stretched over a 135-minute runtime, the effect is more exhausting than exhilarating. There’s no spark to the picture. No sense of urgency behind the entire Fountain search. Even the characters seem often apathetic. Outside of Blackbeard, no one’s motivations are particularly clear. To compensate, the script calls for the various characters to endlessly verbalize to each other exactly why they’re doing what they’re doing when they’re doing it. Frankly, my dear, that’s just poor storytelling. Rob Marshall seems to have mined a fair deal of his inspiration from the Indiana Jones series, but doesn’t quite grasp why those films worked. He pays homage to the opening of the Ark scene from Raiders of the Lost Ark during the mermaid encounter – the film’s arguable highlight, which doesn’t reach the delirious heights it should – and, during the conclusion, the Holy Grail scene from Last Crusade, but without any of the energy or Spielbergian go-for-broke showmanship. Also, Sparrow and Cruz’s Angelica have a similar relationship as Indy and Karen Allen’s Marion Ravenwood, albeit minus the witty banter and nimble playfulness. Both Chicago and Nine had an intentional stripped-down visual plainness to them; they were presented to look like we were seeing them transpire on stage. Somewhat disastrously, Marshall has brought a similar aesthetic to On Stranger Tides. This is one of the uglier blockbusters in recent memory, full of cheerlessly drab colours, sparse, boring shots and poorly lit soundstage work. The Fountain of Youth set, in particular, is so unappealing and phony-looking it's a mite shocking. You half expect one of the characters to turn to the camera and complain "This is what we came all the way here for?" Marshall even manages to strip Hawaii of much of its natural beauty (It’s doubtful the state’s tourism board will be using On Stranger Tides as a calling card anytime soon). Whereas previous series director Verbinski could be relied on to create breathtaking imagery, Marshall just dreams too small to make a film of this scale and scope work. The key to Captain Jack Sparrow’s character has always been that he’s a reactor, not a plot mover. In the first two films, he had interesting players to bounce off of and to drag him into comical situations. Here, he’s stranded. Depp does what he can, and has a couple patented slurry zingers up his sleeve, but Captain Jack spends the majority of the film at the mercy of a villain who couldn’t be any less compelling. Blackbeard may have a zombie crew (unexplained), voodoo powers (also unexplained) and a ship which responds to his psychic command (again, unexplained), but he’s not remotely threatening. The writers have tried to give their baddie an ambiguous touch – is he truly evil or simply flawed and needing redemption? – but instead he’s just a bore; a half-formed idea in search of a reason to exist. Movies of this type are only as good as their villains and, coming after Bill Nighy’s incredible Davy Jones, Blackbeard is a major disappointment and a source of much of the film’s shortcomings. This fourth Pirates picture had to accomplish only one thing to succeed, and that was to provide a strong argument – outside of commerce - for restarting the franchise anew. To watch it fail so badly in its mission is more than a little depressing. 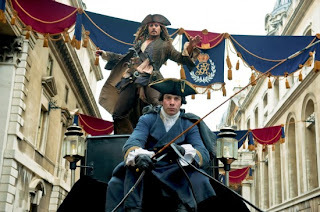 At one point in the film, a character says to Captain Jack: “you’ve never been the most predictable of sorts!” Had the filmmakers kept that line in mind while assembling On Stranger Tides, maybe we would have been spared this summer’s first costly dud.